Drawing of brass monuments inside St Edmund's Church at Sedgefield, County Durham. The brasses have no inscription but probably date to c. 1630. 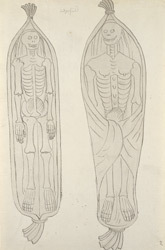 They show skeletons of a husband and wife bundled up in shrouds.